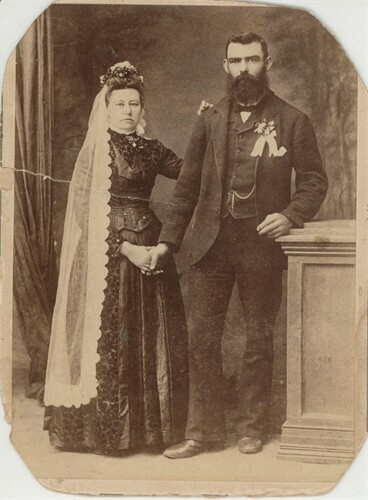 Emil Wilhelm HABEL and Maria Mathilda GROSSER on their wedding day. and, as quick as “Jack Flash”, I was out of my chair, sprinting across the room and fumbling for the “talk” button. Hooley dooley… how exciting. As soon as I heard that correct German pronunciation of our surname I knew David was “the real deal” and way back in my memory box was the name David Habel. Turns out that my children share their paternal Great Grandparents, Emil Wilhelm Habel and Maria Mathilda Grosser, with David. That’s where I’d seen his name; “THE GROSSERS FROM GRUENBERG: 1841-1991” Family History Book!!! David found my story about Habel’s Bend online and thought he should make contact. Best of all is that, whilst I’ve only received info on my children’s Habel Ancestry via some rather scanty “word of mouth stories” added to by on-line research, David is his family’s “keeper” of the their Ancestral documents, photos, family bible, etc., and was part of the Habel family that didn’t re-locate from Loxton to suburbia. Even better is that he’s also most pleased to have made contact is very keen to share and help me get the stories straight. Thankyou David!!! Even better than that!! !… and could it get any better?? ?… is that my children and other Habel fam are equally as delighted. So… not too far down the track lots of laughter, clicking of cameras, scanning of pics will be issuing forth from a beautiful botanical garden setting here in South Oz. Maybe we should be “pre-emptive”, as they say, and hand out free ear-plugs to folks seated nearby. Just can’t wipe the “smile off m’ dial” … and wonder if my extensive, and difficult research, to finally sort out our Habel’s immigration to South Oz, and then those who later beavered off into Victoria, will be news to David? Oh… the thrill of it all. This entry was posted in Grosser, Habel, Habel, Immigration and tagged Emil Wilhelm Habel, Family History, Genealogy, Immigration, Maria Mathilda Grosser, South Australia by Catherine. Bookmark the permalink. Wow, that is really exciting! Good for you! Thanks so much… seems I’m destined to link families 🙂 You might like to look back at: https://caiteile.com/category/families/hembury/ to read about my “sleuthing” and bringing together the family of my husband’s nana in both a book and a re-union late last year. Before signing off, just have to say how very much I enjoy your blog. Introduces me to a whole different culture and in a different part of the world, yet the committment to and love of family is exactly the same. Thanks. I can just imagine the pasted on smile… great to hear such news, Catherine… good times ahead. Congratulations, Catherine! I’m smiling with you. Thanks Nancy… it means such a lot to know that others share your excitement, doesn’t it? Cheerio, for now.